Reason for consultation: Recent diagnosis of Ta urothelial cancer of the bladder status post-TURBT at an outside hospital. Past medical history: Former flight attendant with a history of second-hand smoke exposure. Indication for TURBT: Evidence of residual disease during Blue Light Cystocopy with Cysview. TURBT outcome: TURBT pathology of fluorescing region revealed residual tumor. Treatment plan: Mitomycin C once a week for eight weeks, followed by cystoscopic re-evaluation. Reason for consultation: Hematuria evaluation led to cystoscopic diagnosis of urothelial bladder cancer (presents for TURBT). TURBT outcome: Using blue light post TURBT showed no fluorescences, indicating complete resection. Histopathology reveals Ta low malignant potential tumor. Bladder cancer history: Presented with gross hematuria. Suspected bladder cancer. Previous adjuvant treatments: Treated with a six-week course of BCG induction. Indication for TURBT: On suspicion of recurrent bladder cancer, underwent another Blue Light Cystoscopy with Cysview. TURBT outcome (findings including histology): Showed high-grade T1 carcinoma. Treatment plan: Underwent radical cystectomy, given the progression of tumor following BCG therapy. Past histology/tumor types: Underwent cystoscopy and was diagnosed with high-grade papillary urothelial carcinoma. 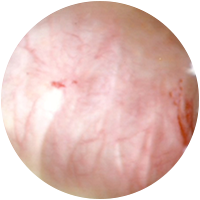 Pathology stated, “high-grade dysplasia and marked atypia.” She sought a second opinion. Previous adjuvant treatments: None. 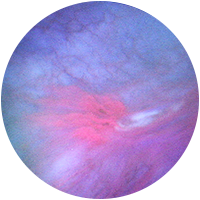 The patient was observed without intravesical therapy and received a follow-up cystoscopy after three months. Indication for TURBT: On suspicion of bladder cancer based on White Light Cystoscopy, underwent another Blue Light Cystoscopy with Cysview. TURBT outcome (findings including histology): Showed persistent, high-grade papillary transitional cell carcinoma and carcinoma in situ. This case study video examines a large, positive tumor with some signs of necrosis, with a small tumor visible at the end of the field. 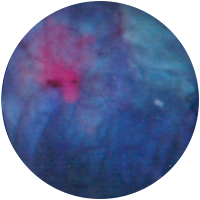 The camera swipes over the margins of the tumor, but it is visible only under Blue Light Cystoscopy with Cysview — it cannot be seen after switching back to white light. Two bladder tumors are visible from the bladder dome. They can both be seen clearly under white light. However, after instillation with Cysview, blue light shows strong fluorescence, making the tumor margins much easier to see. It is particularly important to define the edges of tumors in the dome, since resection in this area is prone to complications. The scar from a former resection can be seen, with fibrin visible under blue light after instillation with Cysview. 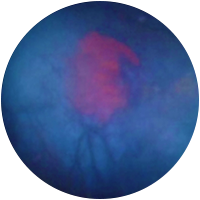 In this case, use of blue light with Cysview enables a clear view of the margins of tissue related to the healing process, rather than malignancy. 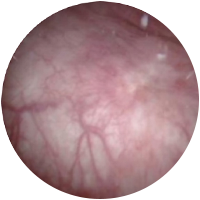 While viewing the dome, two small additional tumors are clearly visible during Blue Light Cystoscopy with Cysview — and would have very easily been overlooked under white light. The bladder mucosa is visible, and the presence of air bubbles is clearly evident. 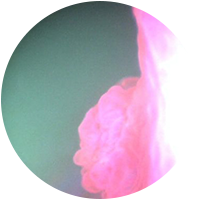 A fairly large tumor is easily viewed under white light; however, during Blue Light Cystoscopy with Cysview, it is possible to define the margins and the absence of concomitant tumor fields.